Canada Lynx ~ The lynx. Status in Wisconsin: Taken off the endangered and threatened species list in 1997. Protected Wild Animal. 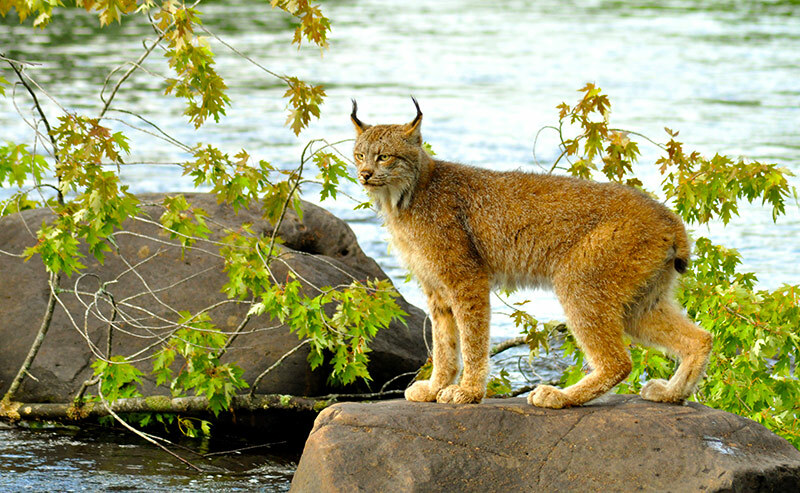 Canada lynx are short-tailed, long-legged wildcats. Known by different names like “le chat,” (French Canadian) or pe-zu (Chippewa), these critters look a lot like bobcats. In fact, most people have trouble telling them apart, but there are differences. The lynx has longer ear tufts. (Check out the hair sticking up from the top of the ears in the photo.) Lynx ear tufts are usually longer than 1 inch. Their tails are also different. The lynx’s tail is gray with a black tip, and the bobcat’s tail has narrow black bands and a black tip. Both lynx and bobcats have back legs that are longer than their front legs. This helps them in springing to catch Snowshoe hares.